Sunnyside offers pleasant accommodation on the slopes of the Blackdown Hills, an Area of Outstanding Natural Beauty, on Somerset/Devon border. It is in an ideal position for touring the West Country. The county town of Taunton is 7 miles away, whilst the North and South coasts can be reached by car in approx 40 minutes. The beauties of Exmoor, the Quantocks, Mendips and Brendon Hills are all within easy reach, as are the more rugged features of Dartmoor. Bristol and Bath are within an hour’s drive while to the west Plymouth, the gateway to Cornwall, can also be reached in an hour. Nearer home there are numerous attractions for the holiday maker, including pretty villages within the Blackdown Hills – an unspoilt and little known area of Somerset. The cottage is available for holiday lets on a weekly basis, but we also consider shorter lets, especially over holiday periods such as Easter. Short term lets also available - ideal for people between moves or looking for a new house in the Wellington area. Sunnyside is situated in the hamlet of Ford Street, which is 1.5 miles from the town of Wellington. Conveniently situated on one of the roads leading up into the Blackdown Hills, but still only 2 miles from Junction 26 of the M5 motorway, the cottage is in a rural location next to a cider orchard and near fields and country lanes. Our weekly rate includes all electricity for cooking, lighting and water heating in summer; oil for the central heating boiler; all bed linen and all bath, hand and tea towels. Want to know what the area has to offer? 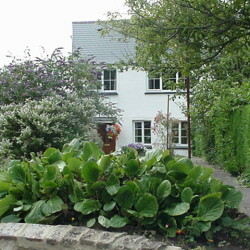 Sunnyside is the perfect cottage to use as a base for exploring Somerset and Devon. From your first welcome, until we had to leave, we can just say thank you and congratulations on having such a good equipped cottage in such a central location. Charming cottage in a lovely rural setting. Will definitely stay again. We had a wonderful Christmas break in your cottage. The well equipped kitchen and cosy open fire were particularly welcome. Thank you! We are now taking bookings for summer 2018 and beyond.